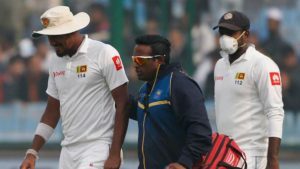 Sri Lanka’s Suranga Lakmal and India’s Mohammed Shami both vomited on the field as Delhi’s notorious smog continued to plague the third Test today. India’s second innings was into its sixth over when Lakmal bent over and threw up before walking off for the ground for the second time in the match. Shami, who said on Monday that the situation was not as bad as was being reported, was then himself sick in the final session. “Our people are in discomfort, I think it speaks for itself,” said Sri Lanka coach Nic Pothas, who saw several of his players once again don face masks. “Maybe Sri Lankan players are not used to it, but then so are many of my teammates,” said the Delhi player. India are closing in on a 2-0 series victory after setting the tourists a massive target of 410 and reducing them to 3-31 at stumps on day four.